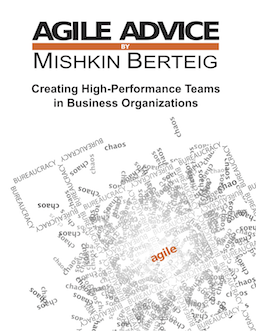 Agile Advice is a multi-author blog headed up by Mishkin Berteig. Agile Advice covers Scrum, Extreme Programming, Lean Software Development, OpenAgile, as well as other topics related to teams and management. Other authors include Travis Birch, David Sabine, Martin Aziz, Jerry Doucett, Rachel Perry, Valerie Senyk, as well as numerous guests. If you are interested in contributing to Agile Advice, please contact info@berteig.com. Agile Advice is part of the family of agile web sites sponsored by BERTEIG. including World Mindware, Scrum Insight, and OpenAgile. Also, we have an associated weekly newsletter that we publish called the Real Agility Newsletter. It features exclusive agile techniques, announcements, and encouragement. We are also proud to announce that we have been listed as #38 in the TOP 100 Agile Blogs for 2015.